It’s not quite 8 AM. My slumber came to an end about thirty minutes ago with the noise from the run-up of a jet. 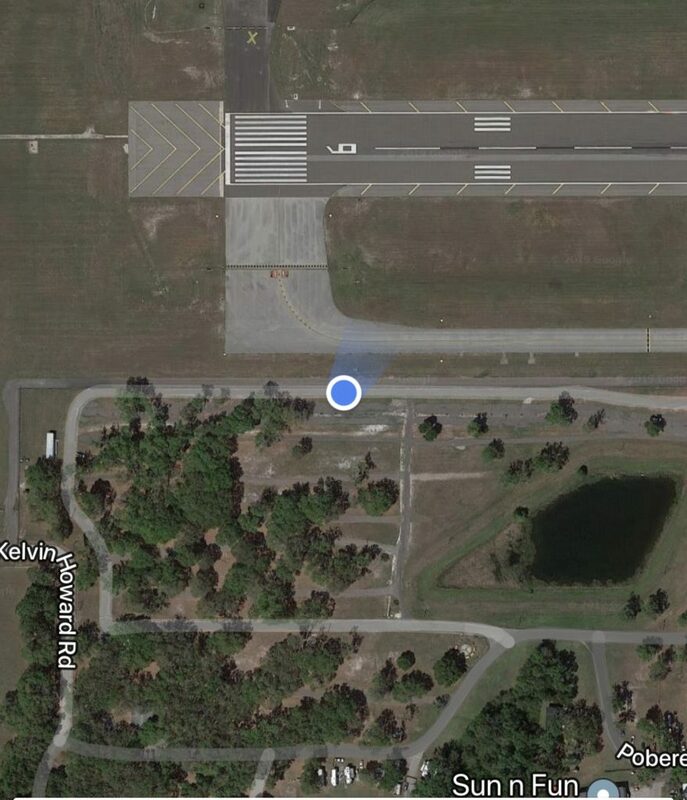 The end of runway nine is about fifty yards from our camper, home-sweet-home for the week. Since all of the flyGIRLS in the camper are awake now, the first order of business is coffee brewing. That was the first grocery item on the list! We all have different plans, goals and agendas during the days here at Sun ’n Fun. This morning, mine, is to take my coffee, camera and laptop and go sit to observe the flurry of activity on the runway. There was an incident on the runway within fifteen minutes of our arrival on day one. Unfortunately, airplanes had to circle above indefinitely as emergency vehicles cleared the remains of an airplane whose landing gear was not fully locked as it kissed the runway. That’s not a good start for that pilot. No serious bodily injuries, only a slightly mangled airplane. I’m quite sure someone’s pride took a nosedive. This seems to have been a scenario straight out of the landing gear failure book and “get-there-itis.” Apparently, for the airplane that was now nose down at KLAL, the gear did not come down as it should have. The pilot tried to manually lower the gear as he was fast-approaching final. There were no indications that the gear was locked as he prepared to touchdown. 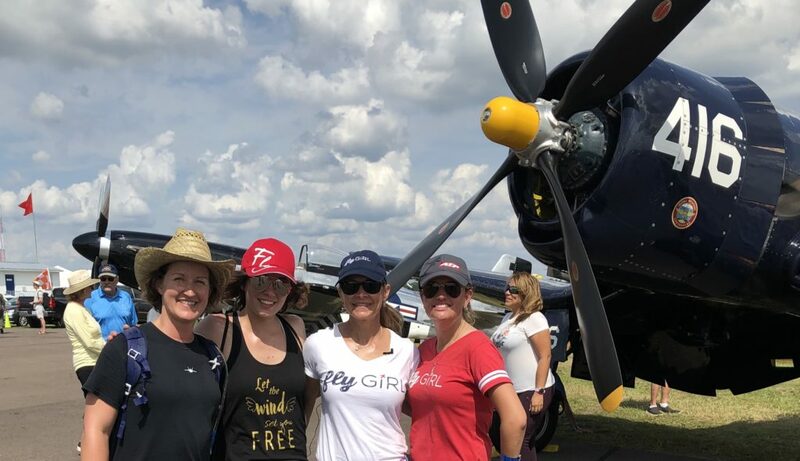 During an event like Sun ’n Fun, there are windows of time for pilots and airplanes to land and take off before and after the scheduled air shows. When the air space opens up, there are a multitude of airplanes circling above, awaiting their turn to land. The process runs like a well-oiled machine when all is going smoothly and there are no incidents. Going-around complicates things a bit for everyone. The pressure to push on so you can get out of the way is pretty high. The stories after the “incident” seem to confirm that the pilot was in a hurry to keep things moving along and made the decision to land. He was probably crossing his fingers that the gear would come down and lock just in time. The bright side of this story is that there were many spectators that will hopefully use this information in order to avoid making the same mistake themselves. 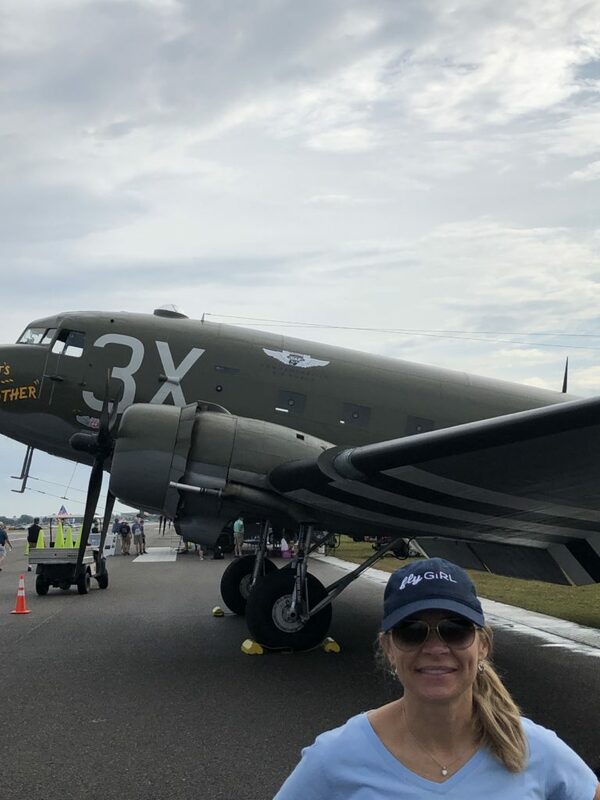 The daily air shows, static aircraft displays, workshops and events during Sun ’n Fun were entertaining, inspiring, and offered many opportunities to meet people and share stories. Every new experience offers learning moments. 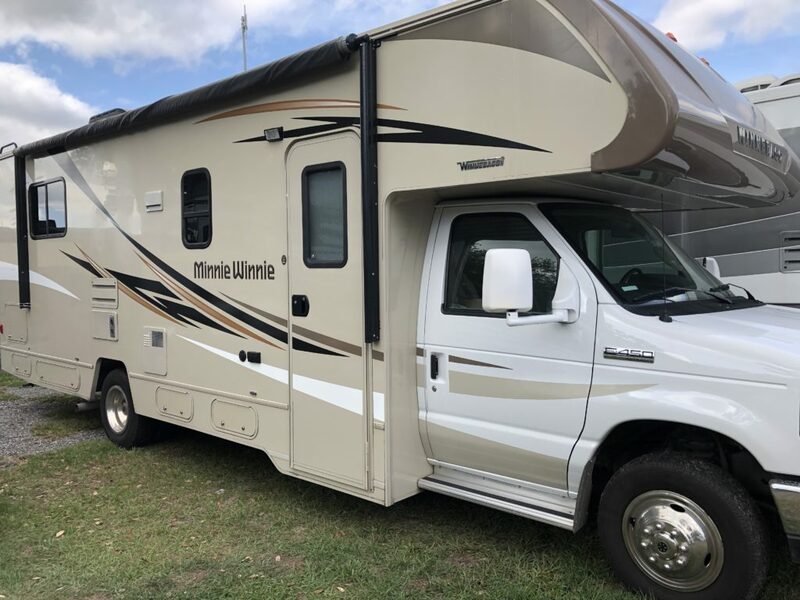 The new experience for me was renting and organizing the rental of an RV on site. Months ago, the RV was reserved. My decision to rent an RV on location was a good one. It was very convenient and cost less than a hotel would’ve cost. It was a bit of a cluster on arrival day but by the end of the day, we were settled into our temporary home. Being on site is a game changer. There’s no traffic and parking to deal with on a daily basis. Thanks to a personal kitchen, you have the ability to eat regular food, rather than chicken tenders and hamburgers every day. We had a prime location next to the runway. We were also surrounded by experienced campers. These “regulars” had every convenience of a home. Thankfully, they were all generous and happy to share. One of our friendly neighbors had rented two camping slots so that they had ample room for an outside canopied patio complete with about twenty lawn chairs, a full bar (with several varieties of vodka), grill, rope lights, golf carts, bicycles and an astro-turf lawn. They were SET UP! The only thing missing was a mailbox. Of course, they were all involved in aviation in some aspect too. We loved them. RV life is all about living tiny. You can barely walk around without bumping your elbows into someone or something, particularly in the bathroom. The only rule in the RV was no going number two! No one wants to sleep in a tiny space with persistent and pervasive disgusting odors from other humans. That rule went unchallenged. We were all in agreement! My RV had an open, revolving door. Each night had a different combination of guests. A couple of them were acquaintances on social media and it was cool to meet them in person and have them as guests (Sara Nisler and Savannah Raskey)😉. One of the things necessary for me at a hotel when traveling is a gym. Keeping a somewhat regular routine helps the days function smoothly. However, the number of steps taken around the air field grounds completely eliminated the need for a gym. That’s the best kind of exercise! You’re getting your steps without really counting your steps or timing yourself. Plus, you can also allow yourself a little bit of the junk carnival food that surrounds the event because you’re walking WAY more than normal. 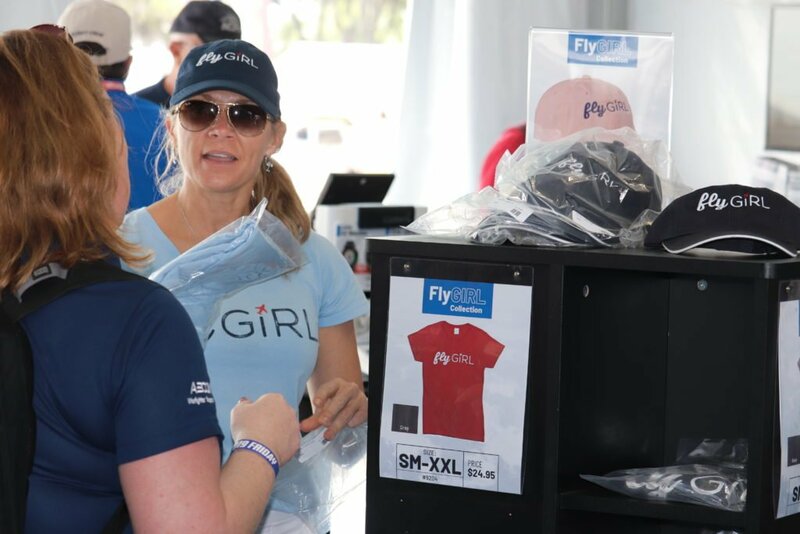 Sporty’s Pilot Shop and I teamed up to work together to promote the flyGIRL apparel. On day two, we were completely sold out of small and medium tee shirts. It was disappointing because we didn’t have more immediately available for customers, but at the same time, it was cool because it meant people were buying them. We are already working together to hopefully eliminate that problem for Oshkosh in July. There were three planned days that customers came to the Sporty’s tent to meet me. This was awesome because many of the people are “friends” of mine on social. Yet, we’ve never met. Putting a face to a name and actually sharing a conversation is one of my favorite things. If you’ve read any of my other blogs, you already know that. This was also a chance to reconnect with people that I only get to see at air shows throughout the year. 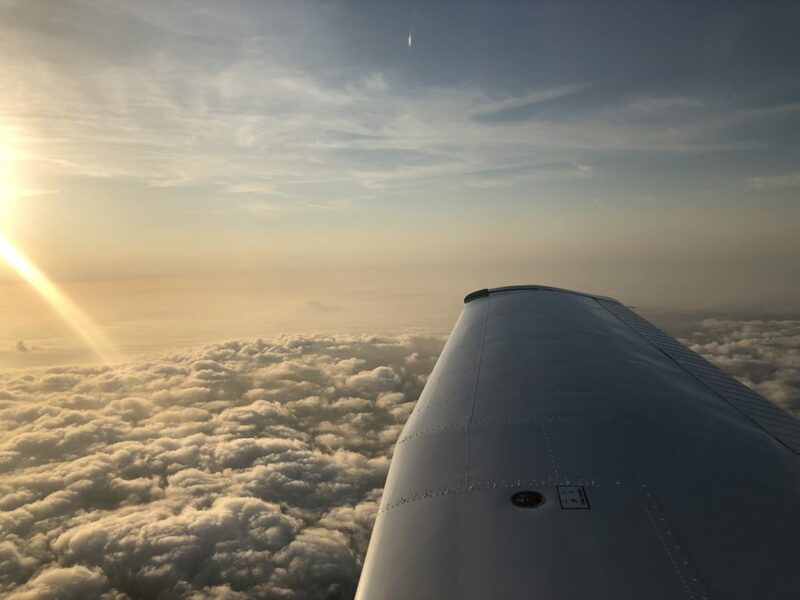 I love to hear what others are up to and doing in aviation. This air show allowed me to bring a new unofficial member on my staff, my oldest son, Jack. Jack loves aviation and airplanes as much as I do. He no longer lives at home and when we see each other in our normal surroundings, there’s typically an argument that ensues. It was my idea to invite him so that we could step out of our normal environment and have some fun together. I needed a videographer and photographer to help me. He’s somewhat artistic and this seemed like a great opportunity for the both of us. We honestly enjoyed ourselves and each others company. There wasn’t a single argument. Maybe this is the secret of getting along?? The success of our time together led me to think of other ways to involve my other sons. The problem is is that they’re all teenagers. Is there anything more I really need to say? Well, if you don’t have teenagers, you wouldn’t understand that getting them to show any kind of joy at an event that takes them away from their friends or from Instagram for even a nanosecond is nearly impossible. Sometimes, it’s just more torturous than it’s worth. I’m convinced after spending time with my 19-year old that it is feasible though. 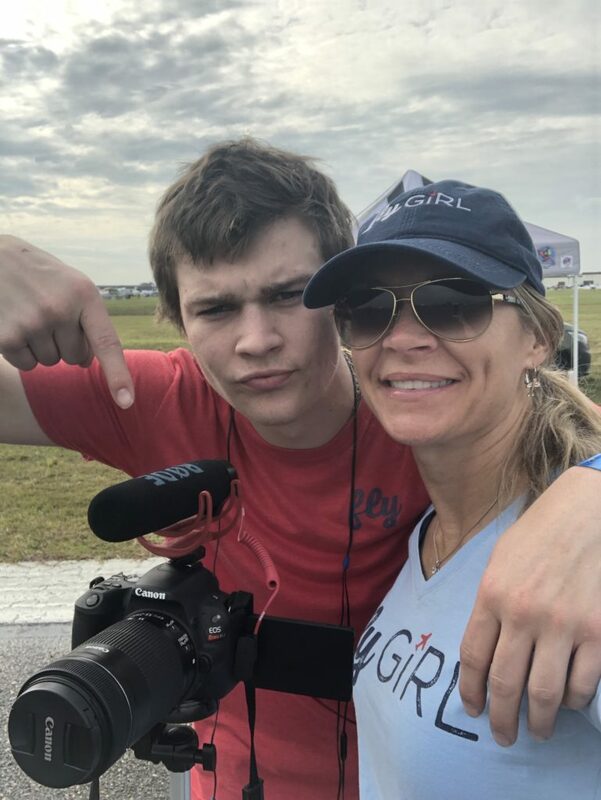 I’m hopeful that I’ll get to spend some one-on-one time with each son at at least one aviation event this year. Recently, I’ve had the chance to learn more about an airplane called That’s All, Brother. If you don’t know much about it, google it. It’s been recently refurbished and has a fascinating history. This C-47 led the Normandy invasion. Kat Healey, is a new inspiring female friend that I’ve had the fortune of getting to know. She helped spark the desire to get up close and personal with this airplane. Even though, it wasn’t just her that drove my respect for the plane. There are dozens of stories about this airplane and its history. Anyone that loves and appreciates history would be interested in seeing the airplane in person. A friend of mine, John, was actually on the crew of this plane while at Sun ’n Fun. Pilots have the ability to earn a spot on the crews of warbirds in organizations such as the Commemorative Air Force. Isn’t that cool? It’s kind of a dream of mine to be on one of these crews (I probably shouldn’t have stated that here in black and white because someone will inevitably remember it and hold me to it). If one goes through training and can demonstrate the necessary skills, they can have a position on such a historical aircraft as That’s All, Brother. There is a need for such volunteers. To me, it would be an honor (Oh, the dreams and goals in my head…one day at a time Natalie). I bought a flight. We had thirteen people on that flight and we were all giddy from the time we boarded until the time they had to kick us off. Our flight also held a very special passenger, a World War II veteran who was assisted by his family. The airplane is bare bones. The seats were hard. The temperature and noise were unregulated. The taxi was rough and jarring. As we flew around sunny Florida, all my thoughts were on the men that took that flight to Normandy nearly 75 years ago. That must’ve been an anxiety-ridden trip, to say the least. Knowing some of those men were my son’s ages made it even more gut-wrenching to consider. It’s a living classroom! Every American should be exposed to this type of hands-on experience. I’m a kinesthetic learner. So, for me, these types of encounters help me understand historical events better. Favorite Part Of Sun ’n Fun? There’s no way I could name one thing as my favorite! Each day was filled with a new encounter or experience. There was a luncheon with two WASPS and a Tuskegee airman in attendance, describing their experiences and answering questions. Surprisingly, there was a jewelry booth selling flyGIRL logo earrings and necklace. That was flattering and confrontational at the same time (my jewelry cabinet now has several new surrendered flyGIRL pieces). Of course, there are some new clothing items that I can’t wait to show off and other memorabilia. 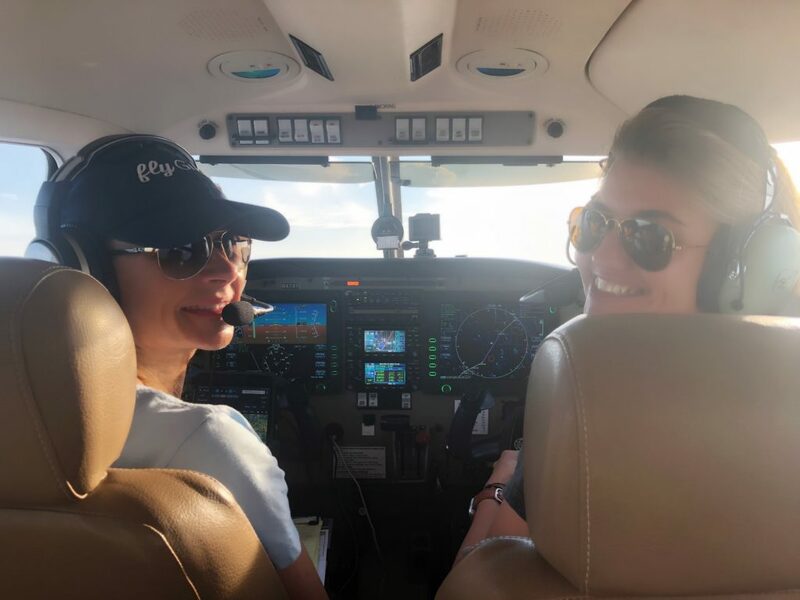 I had ample opportunities to discuss flyGIRLS’ mission of getting more women into aviation, including a spot on Sun ’n Fun radio that my friend Dave arranged. He also included me in on a their little breakfast waffle secret. I’ll be back for those next year Dave! The list goes on and on. Maybe my favorite thing about Sun ’n Fun is that it’s just the beginning of the air show season! I’m looking forward to each air show this season and all the fun and surprises that each will bring. Please come see me at one of the shows near you!!! !